Before you rescue your hen, please take a moment to understand what your beautiful lady has been through, & therefore to better understand her specific needs in your new home. At birth she will not have had time with her mother, & therefore will not have learned many things she may have needed to learn. At day 1 or 2, she would have had her beak burned with a searing hot blade without anaesthetic. Her beak may have remained in relatively good condition, or her beak may be markedly deformed. She would then have been kept in a cage the size of an A4 paper box, sometimes with other chickens, indoors. The floor of the cage is wire. She would have slept on wire, layed through the wire, & stood on wire her whole 300 odd days. She would have eaten layers mash off a conveyor belt. At the point at which her egg laying decreased she would have been pulled by her legs out of the cage, & transported in a ‘rough’ way to you. In the last few days she has probably been fed minimally, & often not given adequate amounts of water. She may have been pecked & bullied by other chickens. She may have pecked & bullied other chickens through stress. Your hen is a battered & abused woman who needs to re cooperate, heal & gain confidence in her new world at her OWN PACE! If you can get hold a natural product such as ‘rescue remedy’ – take ½ a tab for her with you. This will minimise the shock and anxiety of the transportation. You can give her half a tab per day for a few days. Find a room/ place in your home where your hen/s can be relatively undisturbed for the first few days. I often use the shower in my guest bathroom. Place one of your two cardboard boxes on its side with a clean towel inside the box. Place newspaper under & around the box. Have a cereal bowl size bowl filled with clean water, & a similar sized bowl with layers mash. If you are travelling back home more than ½ hour – take some water for her, & try to get her to drink a little before going home. Gently dip her beak in & out of the water, to show her what it is. Gently put the towel over her back, making sure the wings are in place on the body, & hold her against you. She will be sore and bruised, so handle her gently. Close the box for the journey home, and keep out of sun. This will be less stressful for your hen, and safer for driving. Take your hen directly to the safe, quiet space you have allotted for her. If in a bathroom, please close the toilet lid, as she may try to jump up on the loo, & end up drowning or hurting herself. Take her out of the box, & show her food. You can sit water and with her quietly for a bit, however best at this point to leave her to sleep, eat, drink & calm down. Check in every hour or so, and make sure you have seen her eat. You can also feel if she is eating, by feeling her crop. The crop is a storage tank for food, situated on the right hand side of her chest. If the crop is full, or has some food in it, it should feel like a little golf ball. If winter, please make sure that the room is warm – however an exposed heater would be dangerous for her. Make sure that she has a regular change of newspaper and towels, so that she can keep clean and start getting healthy. Let your hen spend most of the day in the ‘rest room’. This is not dull or boring for her. She has had so little so far. 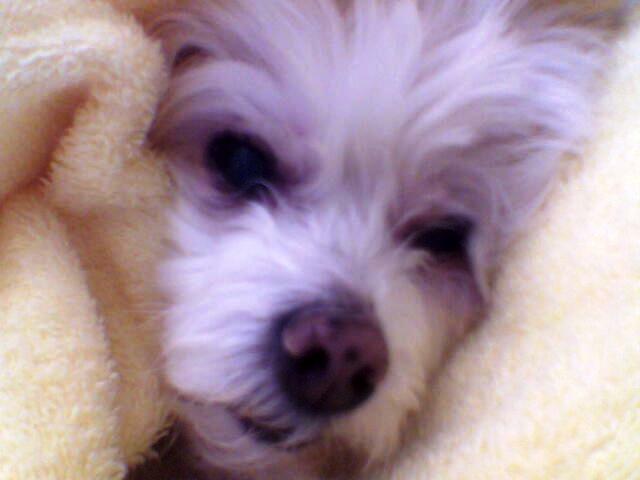 You can take her outside (if she is well), for 2 periods of half an hour. Put her on the grass in the shade, and stay with her while she explores, pecks or lies down. Do not introduce to her to other chickens for a few days, it is too much for her. Unless she has come with other chickens, then they will provide security for eachother. Provide a box for her to walk into if she needs security. Repeat day 2, with a little more time outside, if you feel your hen can handle it. Minimise dogs barking near her, children running around. Keep it quiet and calm. Continue introducing more and more garden time, depending on how hen responding. Make sure she always has access to fresh water and food. If you have made the decision to house your hen out of the house at night. You will need a water proof hen house for her. A wooden dog kennel raised off the ground makes a great hen house. Create a small ramp or ladder for her to climb in. Make sure your hen has plenty of clean straw/ hay or cut veld grass to lie in at night & when she is laying, & that she is well protected in winter, especially if she is missing many of her feathers. Make sure she is locked in at night, so that she is safe from predators. Introduce your hen to the hen house. At roosting time, as starts to get dark, take her & put her in the hen house. Do this each night, until she learns this is her home. Chickens love routine, & will do the same thing each night & morning if that is how things are done consistently. If her house becomes her sanctuary, this is where she will sleep and lay. If you have other chickens, she will learn the behaviour from them. Some of these hens will not be able to climb a big ladder. Chickens have a strong pecking order, & establish it through fighting. However, if a chicken is particularly weak, the rest may kill her. Do not introduce your hen too early to the flock, especially if they are strong & healthy. Give her time to get confident & stronger, & introduce her slowly to the others one at a time. They will go at each other. You have to be close by to separate them, should either one start coming off worst. Intervene and gently push them apart. If your new hen is terrified & being hammered, plse remove her until she gets stronger, & everyone calms down. Small introductions over a few days are best. Suddenly they all settle, & there is calm! I think roosters are hectic, & your hen has been through a lot. I prefer to keep my hen’s rooster free. All they need is a hectic man in their lives, after all they have already been through! If you do have roosters & hens we encourage you to pick up eggs and not let them breed. There are far too many chickens in need in the world. Start with layers mash, as this is what they will be used to. Start introducing laying pellets. Corn is not a substantial enough diet for a hen. Watch your hen to see if she is able to pick up small stones etc from the garden. She will have to learn this, as she has never had the opportunity before, & her deformed beak may make this difficult for her. Watch her, & see how proficient she is before introducing only laying pellets. You can go through a process of mixing the two. My chicks like finely sliced spinach, magi mixed cabbage, cherry tomatoes, apple, raisins, & grated carrot. Sliced spinach, green beans, grated pumpkin, butternut, sweet potato, dry lucern crumbled. All these are over & above their balanced pellets. Berries & tropical fruits are not great for chickens. However, only introduce this sort of thing into their diet once they are settled. This is an addition to their diet, not a necessity. They will also eat grass, leaves etc from the garden. I sometimes add some powdered brewer’s yeast to their food, which assists in keeping them healthy. Sprinkle avian probitiocs on food – helps to improve immunity & prevent gastro intestinal problems. Vital makes a dolomite tablet (calcium and magnesium). Buy these, put through coffee grinder, & sprinkle 1 x teaspoon per hen on food once a week for some additional calcium. Your hen is ill if she stands or sits fluffed up, head drawn slightly into her body. If she is sneezing, or there is mucus coming from her nose. If there is a curdling sound when she breathes. If she is not eating or drinking for ½ a day to a day. If her stools are repeatedly runny. She will need medical attention. Open mouthed breathing (other than if she is hot), discoloured membranes ( angry pink, purple, blue or yellow tinges are all warning signs) Labored breathing, gasping, abdomina breathing, clicking, rasping sounds on intake our outlet of breath. Your hen may not lay for the first few days, or weeks. The stress of changing homes can interrupt egg laying. Your hen may also lay eggs without shells when she is very stressed. This is ok, if all else is in order…that is, if she is not displaying any other sick symptoms. She should lay about 5 eggs a week. As she gets older, the eggs may have ridges in the shells. This is ok, the eggs are still good. Hot weather, and cold weather can also interrupt laying. Make sure there is plenty of easily accessible fresh water around. Hens without water do not lay. 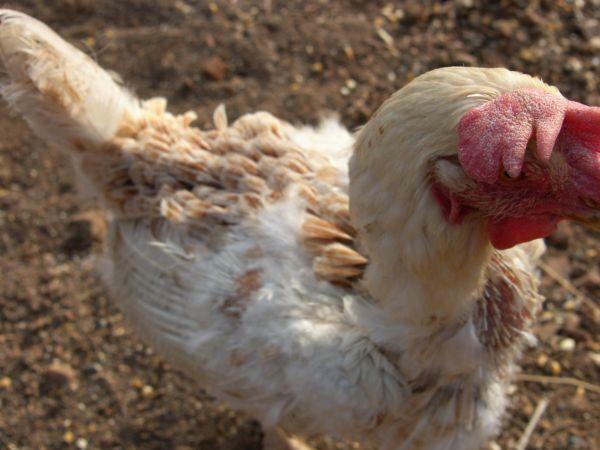 Your hen may have lost many of her feathers through mishandling, malting, wire cages, other chickens. These feathers will re grow. The smaller feathers take 3 weeks to 4 months to grow. Big wing and tail feathers take up to a year to 18 months to regenerate. If you can no longer look after your hen for whatever reason, please responsibly re home your hen, or take her to a reputable sanctuary. If your hen has had adequate medical attention, & is not healing. Plse end her suffering in a compassionate way at your local vet. Don’t let her suffer anymore than she already has in her short life. Enjoy her. The more you put in, the more you will get out. 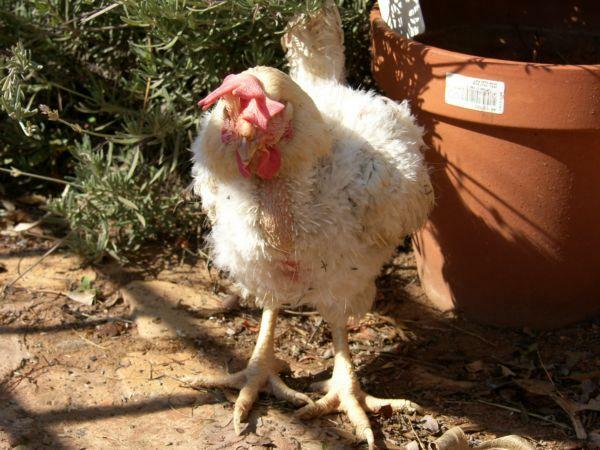 Hens are social, gregarious, love dust bathing, intelligent, love eating, enjoy lying in the sun, like eating grass, digging in soil (digging at the roots of your plants), and sunning their wings on a warm day, & absolutely lovable…. 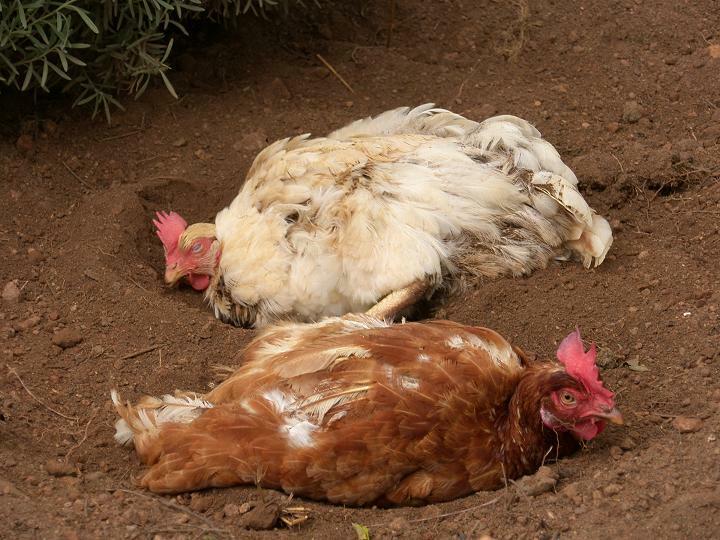 A dust bath assists in quelling excess oil on feathers and gets rid of mites and fleas. Yay, good luck & keep in touch. We love hearing your stories, & seeing photos. Join our face book page & or blog for updates. Please post your updates & pics on our face book page. As chicken lovers we love sharing stories of our fabulous fowl. See all relevant details below. This year has been really busy, and although I have tried to update the blog regularly, I feel that some of our stories have been lost. There has not been time to always write them down. The ease and quick pace of Facebook has allowed another cyber dimension to the rescue centre and organisation, and the combination of blog and Facebook, seems to be allowing a greater reach for raising awareness, and connecting with like-minded people. Our Facebook page also allows other people to add to the page. We have had a few people tell their stories, and post some pics of their chicks. I would like to see this number increase. Here is the address. What did come out of this, was a fabulous database of future homes for hens. Animal welfare organisation FREEME (http://www.freeme.org.za/) sent out an e-mail on our behalf, and we got a massive response of caring animal lovers wanting to assist. This database has grown, and the value has been huge. We have homed 5 geese, 3 mallards, an exotic duck, 9 roosters, 3 puppies (we try not to be speciesist), 53 hens, 1 bull (and a partridge in a pear tree), in a space of 3 months, using this database. Some of these re homings have been on behalf of NSPCA. NSPCA phones us, we send out to database, we monitor and filter responses, send possible homes to NSPCA, they do pre home inspection, and either NSPCA, or us, hands over the animal/ bird. I have made some invaluable contacts at NSPCA, and have some prized cell phone numbers – which allows me to be able to report abuse quicker, and look at future projects. So far, I think the relationship is working well, and the aim of giving a better life to abused animals/ birds is happening. The sanctuary in Magaliesburg is benefitting hugely from the additional care of my father, who now lives out there with our farm manager. The 30 NSPCA birds are doing really well, but it has been, and still is a long journey for them. Some of them have lost weight, the swelling in their legs has gone down, and they are looking better. Some have fared less well, and we are currently addressing their specific issues. All in all though, there is a marked improvement in all of them. This batch of hens were noticeably sluggish and slow to respond. On very cold winter days, my dad would go down to the chicken house at 10am, and take the birds that were lacking feathers and therefore cold, and move them one by one to a sheltered area in the sun to warm up. A little line of cold hens lined up in the sun. At 3:30pm, he would move them back into the hen-house. They seemed to even lack the energy or know how to put themselves in a better position. This level of attention to their welfare is what we are all about, and I believe that our mortality rate was substantially reduced by his exemplary care of the birds. I am so grateful for his input. Sadly Galhinia did not do well at the farm, and became highly anxious, and was being bullied and hen-pecked by the other chickens. She has an amazing personality, and was such an integral part of our family, I think adaptation to farm life was difficult for her. I have brought her back our family home, and she is doing fabulously again. She suddenly has more feathers than bare skin! It has been almost a year since I found her at Zandspruit squatter camp. We also took a little motley crowd of hens and a rooster from Boksburg SPCA, and various odd bods we have picked up along the way. All are doing well, and it gives me so much joy to watch them growing in confidence and doing what chickens should be doing – lying in the sun, dust bathing, foraging in the dirt, and socializing appropriately. At present, we are not taking anymore hens into the sanctuary, as we are focusing on getting the ones we have into tip-top condition. This is using up all our available resources. However, we have so many amazing homes lined up through our database, that will adequately fill the gap in the meantime. Lesego has lost the nail and end of toe for good, but is coping marvellously. She still sleeps in our bathroom at night, and although she is ready to go and sleep in the hen-house, I am not at all ready! I still love going to her last thing at night before bed and giving her a little cuddle in the dark. 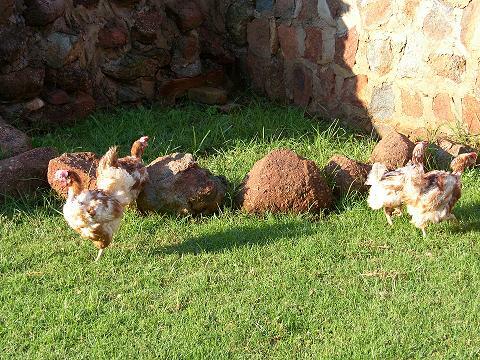 We also have the three pullets rescued earlier in the year, Galhnia and Sarafina. 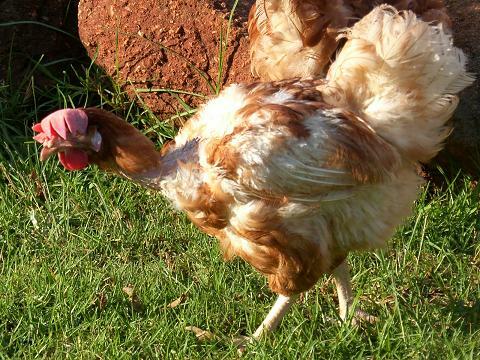 Sarafina is an old lady, and became depressed at the farm after her soul mate and friend Cindy was taken by a rooi kat. Sarafina will live out her natural life with us at home. Buy free range eggs only. Boschveld eggs are the real deal. Woolworths ok. Don’ trust everything that says free range. 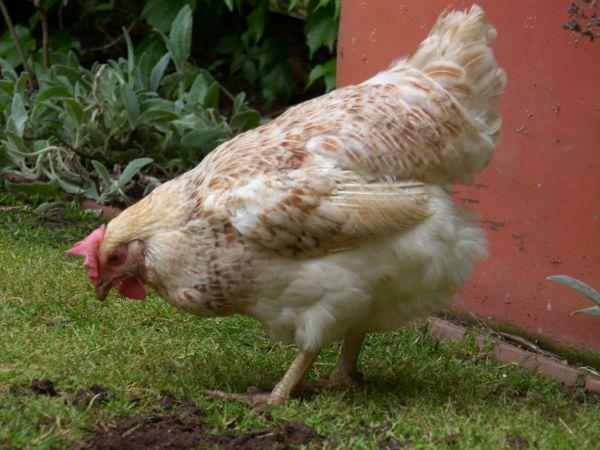 If you like hens and want a few in your garden, and want many hours of joy – contact us via blog or Facebook to find out how you can rescue your own hens, and what it entails. Stop eating chicken! They have terrible lives, and an equally terrible end. Please see our blog for Bellos story. Our broiler. Genetically modified to get from 0 to slaughter in 6 weeks. You are eating GM meat, which is mostly fat and not protein. These baby birds are lame from growing too quickly, and never have the love and comfort of their mothers. Don’t support this cruel industry. if you are not already vegan or veg, have meat free Mondays. If you can think of anything else you can do…..let us know….. This was a post posted in March of this year. I am re posting it, as it gives a good idea of what the majority of our hens have gone through, and the partial process of rehabilitation. 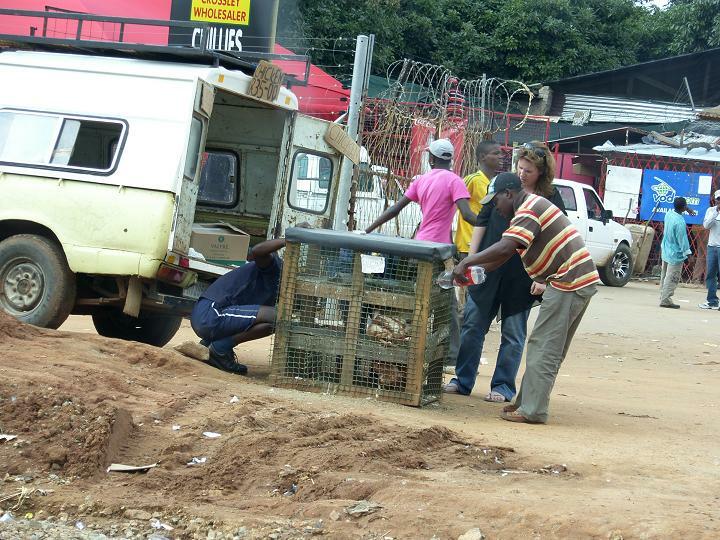 On Sunday I went to Zandspruit to rescue 4 chickens. 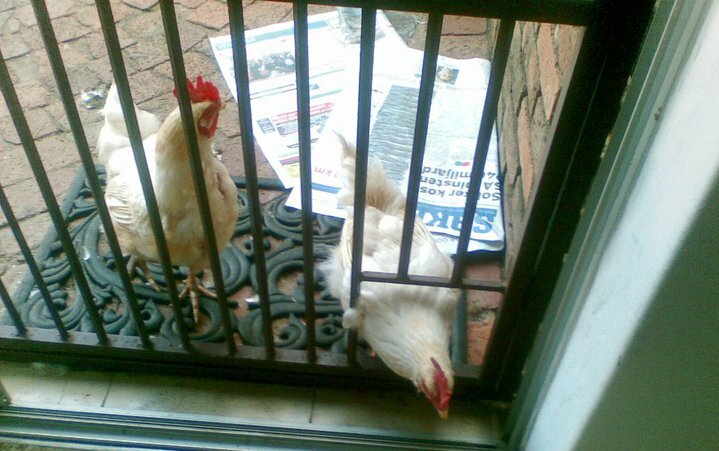 3 for a woman in Kyalami (who responded to our article in animal voice, and so generously made space in her home for some hens), and 1 for Ralf in Parkhurst. My usual seller was not there. 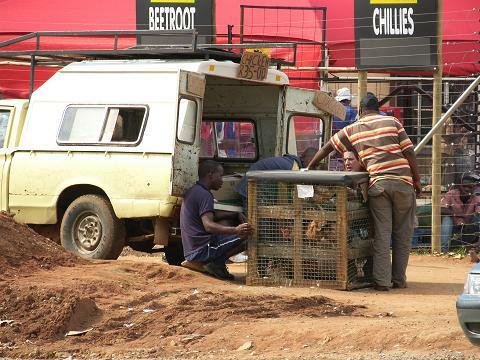 The guy who was there had the chickens in very low-roofed cages. They had no water and no food, and Sunday was hot. These chickens are ex laying hens who have been in a battery farm for just over a year. At 2 days they would have had their beaks seared short with a burning blade – no anaesthetic. This is to ensure that in their crowded conditions, they do not start to cannibalize each other. These hens have been deprived of a mother figure, and so have not learned many of the things they should have. For 300 days they live in a shed in a wire cage no bigger then an A4 piece of paper. They may have had to eat food off a conveyor belt or trough in front of them. They would have stood on wire, slept on wire and lay on wire. Light is manipulated to get an extra egg or two a week. After 300 days their bodies stop egg laying for a period of 90 days. It is not economically viable to feed them through this period, so the farmers (are they really farmers? do they deserve that title? Farmers conjure up images for me of nice, warm people, who care and love their cow called Daisy, and chicken called Henny Penny) send them to cull depots. The process of transportation is traumatic and rough, and these chickens are deprived of enough food and water. 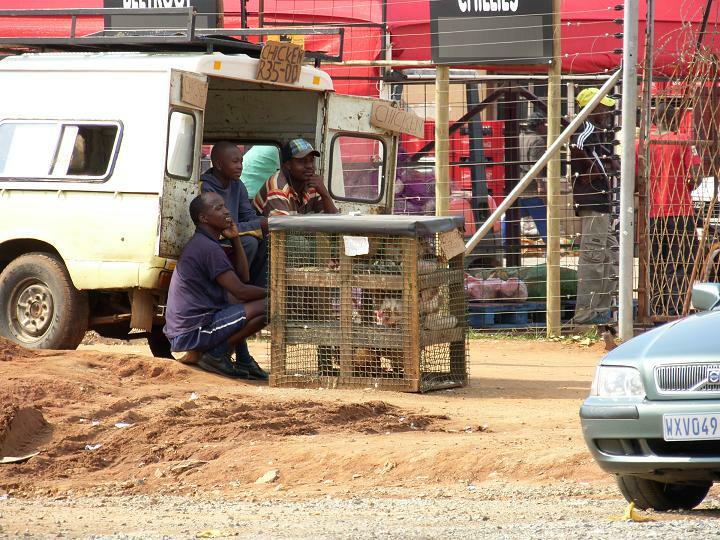 At the cull depot the hens are sold to informal traders, who use whatever rudimentary form of transportation and housing they have to get them to the townships and informal settlements for re sale. 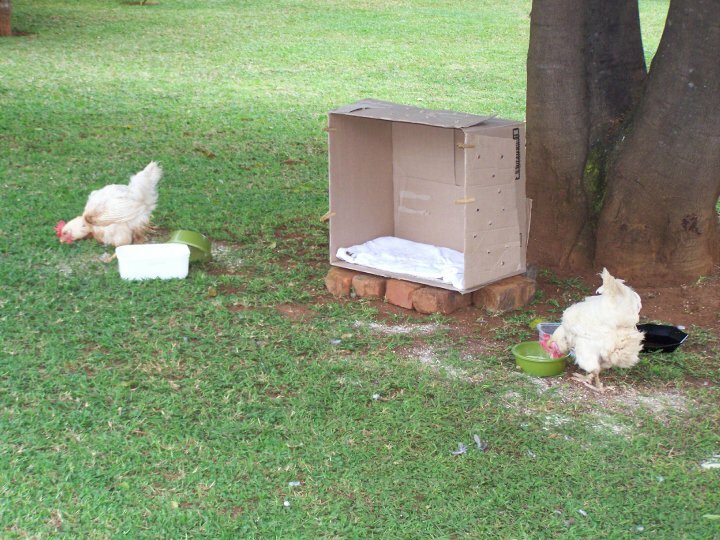 Again these chickens are not given adequate water, food and shelter from the elements. This is how they spend their last days awaiting their inevitable backyard slaughter. The handling of the chickens is also coarse. 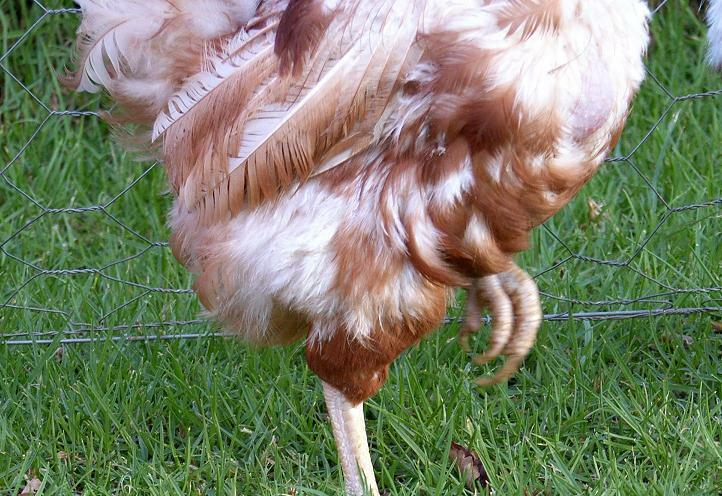 The chickens are pulled in and out of the cage by their legs (often causing breakages or dislocations). They are carried by their legs and often their legs are bound with old plastic, wire…whatever is easily available. Our rescue on Sunday was challenging. The cage had a very low roof, and it was therefore difficult to get the struggling hens out with care. At first the seller started the process. However, I could see that legs were going to be damaged as he yanked the first hen to the door by her foot. I took over, and gently prized each one out holding their wriggling bodies. These particular hens were dehydrated, anorexically thin and terrified (not uncommon). They are missing a lot of their feathers. Please be aware of what you are supporting when you buy non free range eggs (well thats another story, but it is marginally better than non free range eggs). Also be aware of supermarket chains using non free range products in their baked goods. Once we had got the 4 into the box I had brought to transport them in, I paid, and then started the process (which I always do) of begging, pleading, asking, chatting, preaching, cajoling, negotiating a better life for these hens pre death. The ones left. Food is not something I can always negotiate, as it is expensive and therefore unlikely to happen. We can usually get water to the hens. This particular seller was very open to getting water for them – whether this was his attempt at appeasing me for future good customer relations, or whether he will continue to water in my absence, I do not know. Having got the 4 chickens back to the farm, I put them into a grassy enclosure we have created with a dog kennel with straw for shelter. We placed a number of bowls of water and food around the enclosure, and left them to unwind. It takes time for the hens to recognise the bowls we are giving them as water and food. I observed them for an hour or two until dark. I was not satisfied with their intake of water, given that their combs were drooping due to lack of nutrients and dehydration. I crop fed the 4 of them with the assistance of my husband Nick. Crop feeding is a process of inserting a tube down the throat into the crop (a holding tank for food situated on the right hand side of the chest), and syringing food directly into the crop via the tube. Crop feeding is an invasive procedure, and can be dangerous if you get the tube into the lungs and not the crop. I gave them a watery mixture of pronutro, pro biotics, calcium and nutri calm. Crops full we put them to bed. I could also sleep better knowing they had some nutrients and most importantly fluid in them. This would increase chance of survival till morning. The 4 hens spent the next day feeling sun on their backs for the first time, grass under their feet, and having easy access to food and water. They are traumatized, tired, sore and unfit from spending no time in their lives roaming around. They slept much of the day, ate and drank, and 2 even managed to produce an egg each. Nick and I trimmed their excessively long toe nails, which grow unhindered in the wire cages. The hens have no opportunity to wear them down through scratching and walking. Their nails are often so long, it cripples them. They are now back in Parkhurst, under observation for a day or two. Once I am sure they are not harbouring any viruses, and they are eating and drinking adequately, they will go to their new and loving homes. “Everybody here at the parkhurst branch of FarawayFarm is very excited and ready to welcome her to a life of comfort and peace. I am so moved by his compassion and empathy, and so grateful for other people in the world who feel the way that I do. If you are wanting to rescue and rehab your own chickens, or provide a home for an already rescued pair of hens or more. Please contact me on this blog, and we will endeavour to do all we can to assist you through this process. It will change your life, and your hens! So much joy in store for you both. The Kyalami chicks are called Do, Re, and Me. Ralfs chick is called Prude. She had a friend called Trude. All the girls are doing excellently. They escaped death by a few minutes. The ones we left behind were not so lucky. Join us on facebook for more regular updates, chats and pics. You can also post your own stories and pics. On 27 February 2010 our dearest miniature Maltese poodle, Roxy, passed away at the age of 19 years and six months (see pics numbered Pet 1 to Pet 3 of her). 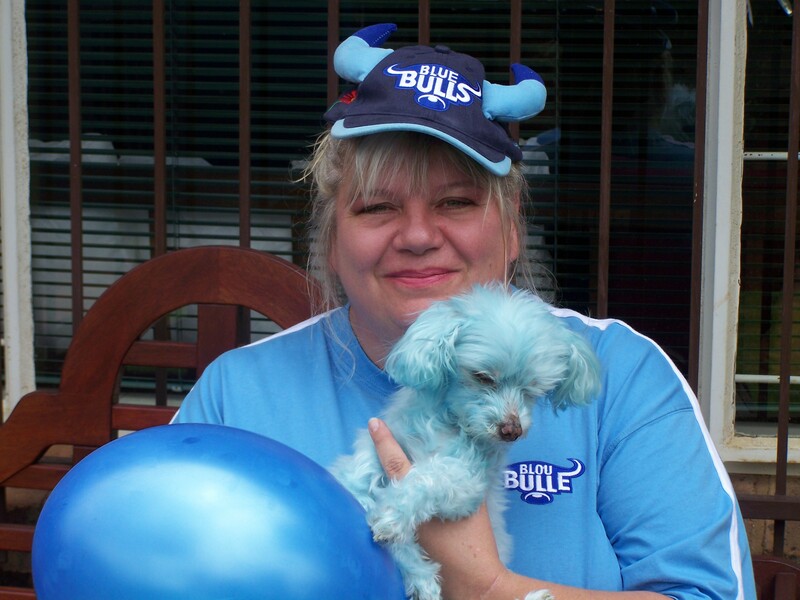 She made our lives fun and we were completely heartbroken to see her suffer and having to be euthanised in the end. We swore that we would never have another dog, not ever. As the days passed, I just couldn’t stop crying. Being a freelancer I work from home and Roxy was always by my side to keep me company. Eventually I became very depressed, but flatly refused to get another dog. I just couldn’t do it. Then in May 2010 my path crossed that of Candy Ristic via a group called Compassion in World Farming. 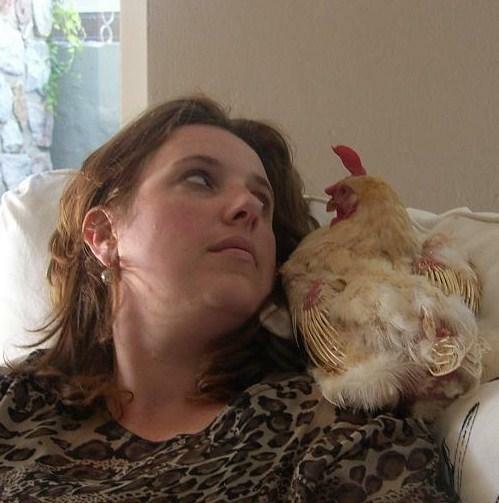 Candy is the founder of “Chicken as pets not food – Chicken Rescue and Rehabilitation”. (They also have a Facebook page.) This organisation rescues and rehabilitates ex battery hens and aims to raise awareness around the cruelty of factory farming. 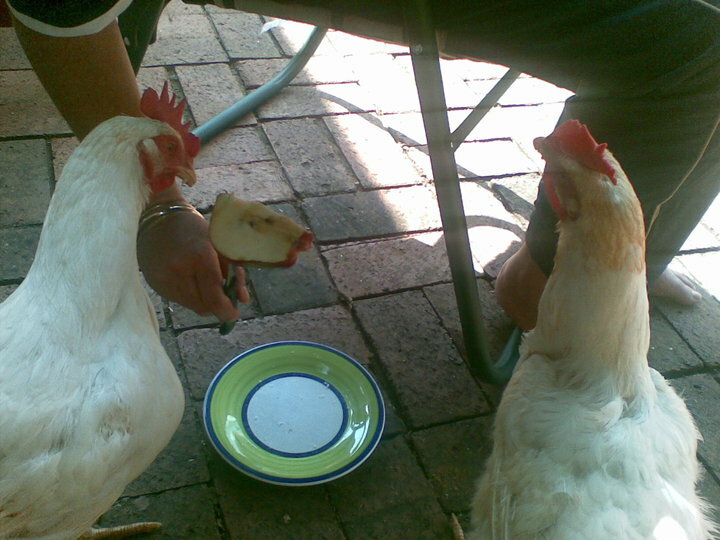 To make a long story short, I picked up our two battered battery hens from Candy on 2 May 2010 and brought them home to our chicken h(e)aven here in Florauna, Pretoria (Pet 4 to 7). Gin (Pet 5) and Tonic (Pet 6), as we named them, were extremely traumatised and nearly died of shock when they first heard the neighbour’s dog bark. We put them up in a cardboard box in our bathroom for the first two nights while we had a wooden house built especially for them (pic Pet 8). They adore spending time with us and when we sit outside, they immediately run up to us (and our guests) to demand their little bite or drink 😉 (see pics Pet 12 and 13). Gin and Tonic are pure joy to watch and have given me back my own personal joy: And for that, I will alway love them. Our entering this competition is also to create awareness regarding the horrible conditions at battery farms. Please read more about Candy Ristic’s organisation at chickenrescueandrehabilitation.wordpress.com.